Mr. Gianelli: Uh, I read in this magazine that you pilots today suffer from this ailment caused by flying too many hours at too fast a speed. I-It�s called jet lag and it dulls the senses and slows the reflexes. What do you say to that? Dr. Bob Hartley: Ar-Aren�t you going to answer the question? Howard Borden: Oh, I�m sorry. I thought you were talking to Bob. Uh, what was the question again? On the basis of my TV viewing habits, as well as my occasional glimpse into stand-up comic routines, it seems that a comedian can be good at either stand-up or a sit-com. This is just one of those rules wherein Jerry Seinfeld's stand-up never reaches the success of Seinfeld. Conversely, Bill Cosby's stand-up has me rolling on the floor with laughter, while his numerous TV shows have me rolling on the floor in a convulsion. The one exception to this rule, as far as I'm aware, is Bob Newhart. He not only is my personal favorite stand-up comedian, but he had two great sit-coms: The Bob Newhart Show and the later, better Newhart. 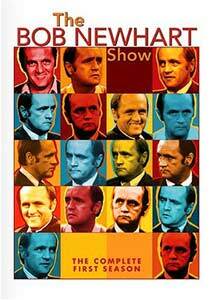 The Bob Newhart Show: The Complete First Season DVD set features all 24 of the episodes from the 1972-73 debut season. Picking up on the success of his famous phone call conversation bits, the series begins with psychologist Dr. Bob Hartley (Bob Newhart) discussing treatment with one of his patients. It became the trademark of the show, with nearly every episode featuring a phone gag of some sort. However, the quality of the writing elevates the character of Bob Hartley to a level beyond the comedian Bob Newhart—by no means is that a knock to Newhart himself, it's just that he isn't only playing himself on this show (though, to be honest, there's some of that at work here). Perhaps the greatest strength of The Bob Newhart Show is the interaction between Bob and his wife, Emily (Suzanne Pleschette). Ranking up there with Laura Petrie and Debra Barone as one of the all-time great TV wives, Emily is a loving, empathetic school teacher who both creates moments of agony and joy for her husband. In the show's premiere, Fly the Unfriendly Skies, Bob is taking a collection of patients who suffer a fear of flying to New York City. Utilizing this opportunity for a vacation with his wife, Bob finds his plans foiled when he discovers that Emily, too, is deathly afraid of planes. The constant complaints about flying through turbulence from their pilot neighbor, Howard (Bill Daily), only make things worse. As the season develops, the marriage between Bob and Emily does as well, incorporating a variety of visitors and friends. Fans of The Simpsons will likely recognize the name of Marcia Wallace, who plays Bob's receptionist, Carol. The constant problems of Carol's inadequate job skills, such as not being able to write appointment reminders legibly, create numerous comical situations. Along with his dentist friend, Jerry (Peter Bonerz), the two swap stories with one another and even dine together from time to time—culminating in Jerry sleeping in Bob's office in Who's Been Sleeping on My Couch? The writing weaves the different characters together quite well, allowing them to enter in and out of storylines without it ever feeling awkward to have the character suddenly appear in order to deliver a punchline. However, in my mind the office portions of the show never feel as natural as the scenes between Bob and Emily in their apartment. P-I-L-O-T is a tender episode of the two trying to adopt a baby, only to discover that it would take longer to get one through adoption than if they were to make one of their own. There's a sweetness in their love for one another, perhaps a bit cheesy and sentimental, that just feels nice. Only in the realm of TV can such a peaceful marriage exist, where what little conflict there is can be neatly tidied up inside of 25 minutes. Hell, the fact that one of Bob's patients, Mrs. Walker (Emaline Henry), falls in love with him in The Two Loves of Dr. Hartley doesn't even pose a serious threat to their marriage. Indeed, there's some TV magic at work here. In an age where divorce and bad marriages are so common, it's nice to see a depiction of a happy matrimony. Although The Bob Newhart Show is not as important a milestone in TV as something like I Love Lucy, it still lightens my heart and puts a smile on my face and causes me to laugh out loud. The era in which the show was made doesn't really enter into it, making it a timeless series for all to enjoy. Image Transfer Review: The 1.33:1 image doesn't seem to be any better than the re-runs from TV Land, but it's not of such a low quality that it detracts from the show. Grain is noticeable throughout and the overall image is a bit dirty, but this could be a result of the source material. Audio Transfer Review: Presented in both English and Spanish mono mixes, the audio is clean and accurately reflects the intent of the show's creators. Like the image transfer, it's nothing to get excited about. Extras Review: There are no supplemental materials on this three-disc set. Each disc has eight episodes, four on each side, and is single layered. The discs are contained within a cardboard slip case, in one of two plastic cases. Despite a lackluster release from Fox, The Bob Newhart Show: The Complete First Season still is worthy of a purchase due to the quality of the content. The audio and image transfers are nothing to get excited about on this barebones DVD, so it seems like this set is meant purely for fans.